A quick look at SiteGround and you’ll see the difference between this web host and the majority of the others is extreme attention to detail, one of the best self help sections we’ve ever encountered and a staff that really cares about the SiteGround brand. 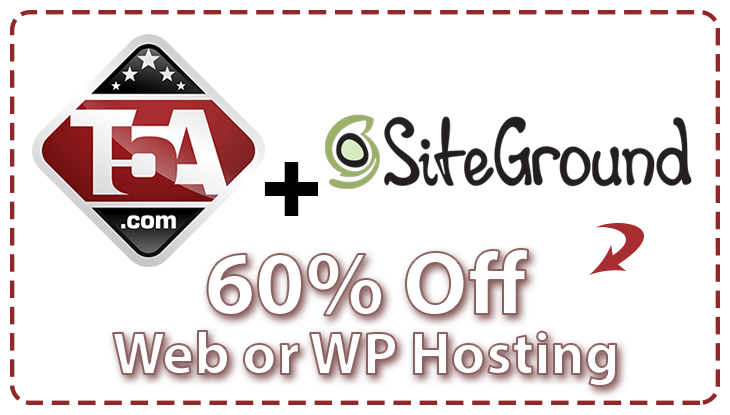 SiteGround has reached out to Top Five Advisor and has offered an exclusive 60% off discount to all readers of this website which will work on any of the three shared web hosting plans that they offer. Want to learn more about what SiteGround has to offer and why we love them so much? See our SiteGround review. 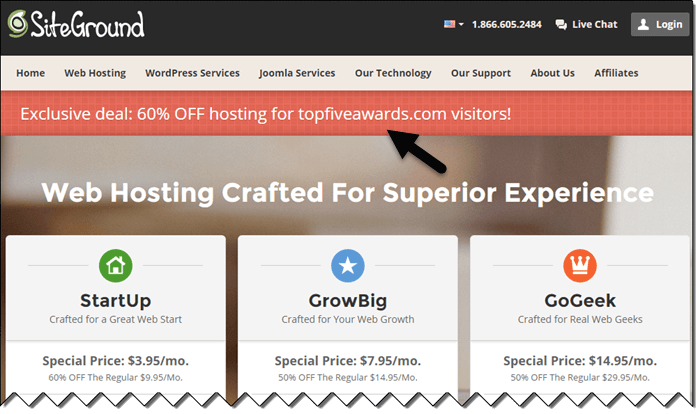 Using the button below, you will activate an instant discount on any SiteGround web hosting service including their three most popular hosting plans. The StartUp plan offers hosting for one website, 10GB space and optional WordPress hosting with a free site transfer and a free domain name registration for the life of your account. Hi, this is Scott Buehler, the owner of Top Five Advisor, with a full guide that will walk you through the entire SiteGround coupon signup process. There’s a few choices along the way that might confuse you which is why I’ve written this guide to answer those questions and make the ordering process as quick and easy as possible. In order to activate the discount, you will need to click the button above. This will open a new browser tab in your browser so that you can continue to follow along here and complete the order process in the other tab. Easily switch between tabs to follow along. Now that you have a new tab open on SiteGround, you should see the above screenshot which will look exactly like or close to what you are seeing. This is to help you visualize that you are indeed on the right website and have started the process correctly to this point. There’s only three choices to choose from. Here’s a modified screenshot of your three choices. Your screen will be different because I’ve removed the orange Get Started buttons that you will see to help prevent possible confusion. As you can see, I highlighted and recommend the StartUp plan because it offers the cheapest plan while still having the majority of features that most readers of this website will need. Your total cost will be just $47.40 for an entire year after claiming our SiteGround coupon and following the remaining part of this guide. When should I choose the GrowBig or the GoGeek plan? 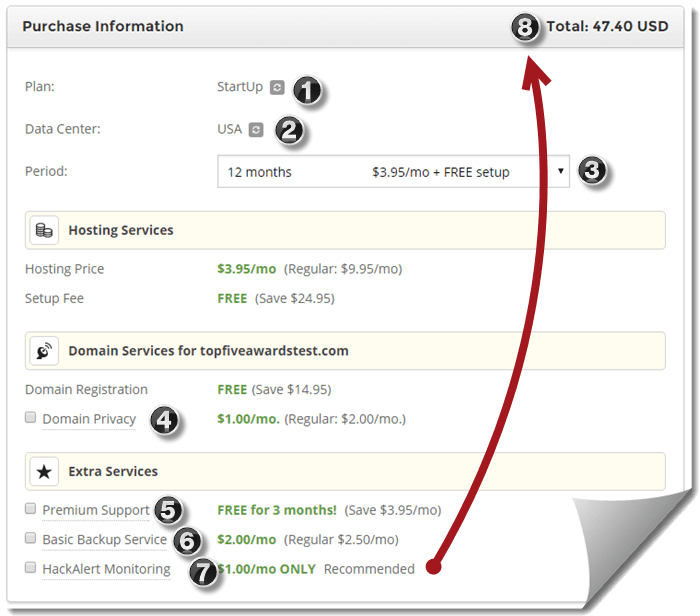 The StartUp plan only allows you to host one website up to 10GB in size. If you need to host multiple sites, then you’ll need the GrowBig plan. If you need E-commerce features, the GrowBig plan also offers a free SSL certificate for a year. You will only need GoGeek if you need more than 20GB space, access to PCI compliance and their staging service (see FAQs at the bottom of this page). If you are starting your first website, I strongly recommend starting with StartUp unless you need Ecommerce. If you decide down the road to add another site, SiteGround is a quick live chat or phone call away from upgrading to a larger plan. Plan Chosen - Already 50% Done! Go ahead and click Get Started on the plan you have chosen. The following page will allow you to choose a new domain name or host with an existing domain name that you already own. If you don’t have a domain name, simply type in a domain name and click the blue Proceed button. If the domain you chose is not available, it will let you know after clicking the button where you can then test variants until you find something you love. Once you find a domain that is available, it will take you to the final page. You Made It To The Final Page - 75% Done! On this final page, fill out your contact information, chosen password and your payment information. Under Purchase Information, there’s a few things I need to call your attention to so that you don’t accidentally purchase services that you may not want or need. Below is a numbered screenshot to help you follow along. Plan: Make sure it has the plan you’ve chosen. For most, it will be StartUp. Data Center: You can choose USA (Chicago, IL), Europe (Amsterdam, NL) or Asia-Pacific (Singapore). Choose the location that is closest to the majority of your customers. Period: The SiteGround coupon is not a permanent discount. On your renewal, you will be asked to pay the normal rate. See FAQs for my suggestions if you are thinking about a 24-month or 36-month package. All lengths are the same price which is wonderful to see compared to other bait-and-switch hosts. Domain Privacy: If you’ve chosen to have SiteGround register your domain name, then you will see this option. I recommend turning off this feature and simply registering your account with a non-primary email address that may (or may not) get spam. Premium Support: You don’t need this because they already will provide exceptional support based on my testing. Their self-help section has answered almost all of my default questions via search in my SiteGround review. Basic Backup Service: It’s important to understand that SiteGround will offer you backup service with this unchecked. The difference here is that you’ll have access to 30 of those most recent backups to do quick restorations. I recommend unchecking this option and follow my WordPress backup guide. HackAlert Monitoring: This is a 3rd party service that we recommend unchecking. If your site becomes popular and profitable, then I’d recommend subscribing to a service like this, but for most, it isn’t needed. Once you’ve followed the above recommendations and have turned off the SiteGround upsells, you will see an amazing final price of $47.40 unless you chose a longer term. Confirm the Terms of Service then click the blue Submit Order button. You're Finished - Hope I Made It Easy For You!! Congratulations! Simply wait up to 30 minutes for an email to be delivered with your SiteGround login and hosting information. While you are waiting, scroll to the bottom of the SiteGround page and find a Tutorials section that has a knowledge base and WordPress, Joomla, Magento and Drupal tutorials. These are amazing sections that are extremely detail oriented and easy to follow just like this guide. If you have any questions, the knowledge base has a search bar at the top that you can type your questions. Unlike the majority of hosts, SiteGround is very thorough and you should be able to find an answer to any question you have. If it doesn’t, go back to the main page and click the Live Chat option in the upper right header area. You just might be surprised at how fast those guys and gals are! Please tap or click on the question below to reveal my answer. If there's a question I haven't asked, scroll down to the bottom of this page and click the contact us link on the left. Be sure to mention SiteGround in your question so I can provide a timely response. This is a feature by SiteGround on the GoGeek plan that allows WordPress or Joomla users the ability to transfer their live website to a separate staging area so that they can modify and test code on a non-live environment. ​Once the testing of code is completed, the user can choose to push the changes to the live site or delete the staging area. Should I choose the 24-month or 36-month options? The prices you see on this SiteGround coupon page are single use discounts. After your initial term is up, you will be asked to renew at their normal hosting rates. What is the GrowBig or GrowGeek SuperCacher service? SiteGround offers a caching service for static websites, dynamic websites, WordPress, Joomla, Magento and Drupal. What this will do is reduce the database requests on your hosting account and will serve your web pages faster to your visitors (thus increasing the chance for sales). After installed, you will see your website load up to 4 times faster and you'll be able to serve way more traffic before needing another upgrade. It should be noted that there are popular WordPress caching services available if you have chosen the ​StartUp plan. I usually recommend customers start non-cached and after they build their site up and get profitable, call in and upgrade to GrowBig and setup this feature then. Money is traditionally tight for website startups which is likely why you are on this SiteGround coupon page in the first place. PCI compliance is only available on the GoGeek plan and is a set of data security standards for Ecommerce websites. You'd only need this if you are directly accepting payment cards directly on your website and want to make sure your clients are ordering on a properly maintained safe, stable and secure network. Want to take your site to the next level with a full suite of digital marketing services provided by Scott? Whether you need more leads, sales, traffic or suggestions to help your site rank better in search engines, simply use the contact link on the top of this site and get in touch. Mention you ordered through this SiteGround coupon page and I'll throw in a lifetime discount on any of my services.